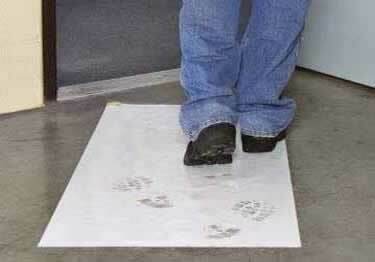 Surface Protection Sticky Mats are tacky mats that keep light dirt and dust from entering or leaving the jobsite. Simply step on the mat and the sticky surface of the mat pulls dirt or dust off your shoes. Once the sticky mat is dirty, just peel away a layer to the next clean tacky mat underneath. If you plan on moving the sticky mat to another location purchase the mat mount. The mat mount will allow you to move the sticky mat from site to site or around the jobsite. Each sticky mat comes with 30 disposable sheets. Available in packs of 4 mats (of 30 sheets). Two sizes options available 18" x 36", 18" x 45", 24" x 36", 24" x 45", 26" x 45", 36" x 45", 36" x 60"
Sticky Mats are available in sizes: 18" x 36", 18" x 45", 24" x 36", 24" x 45", 26" x 45", 36" x 45", 36" x 60"
Surface Protection Sticky Mats are tacky mats that keep light dirt and dust from entering or leaving the jobsite. Simply step on the mat and the sticky surface of the mat pulls dirt or dust off your shoes. We installed our Sticky Mats at each entrance to the office to help minimize the dirt and dust coming from the warehouse. We are a General Contractor who does Commercial Construction. We use these mats on all of our job sites, but predominately on our hospital/healthcare projects because we need the best dust control mats made to maintain the strict health hazard policies. We highly recommend this product! Good price, good product. Use at all our doorways to keep floors cleaner. We replaced shoe covers with the Dust Control Sticky Mats at our historic house museum. They work great to protect our rugs and are much easier to use than the booties! Help create a temporary dust or heat containment wall system. 10 & 16 foot height poles available, sold in quantities of 2.